dominique knitting: more socks - but these are mine ! more socks - but these are mine ! In between the mindless sock knitting for DS, I knitted some socks for me. 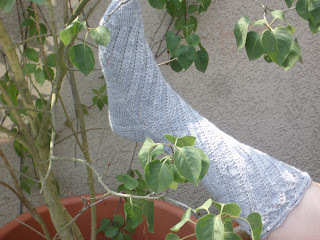 The pattern is 'Roza's Socks', by Grumperina. The pattern was in Interweave knits, spring 2007 issue. They were an easy knit, once you get the pattern in your head, and are used to the different manoeuvres of creating yarn-overs and knitting those togehter with other stitches. I am not good at explaining this, the patern does a better job at that ! These were knitted in Cherry tree hill supersock merino, color 'African Grey'. It's the first time I knit socks in a 100% wool yarn. It has a tigth twist, so I hope they will hold up well. They sure feel very nice on my feet ! I also started the 'spiral boot socks' (IK summer 2007 issue), and I had a problem in the beginning. First you start by knitting a lace cuff. That went ok. Then you need to start the spiral pattern The pattern tells you to keep the same stitch count on each needle, and knit whole pattern repeats on a needle. But, the stitch total is 80 stitches, and the pattern repeat is 7 stitches. The stitches are divided as follows : 16 stitches on ndl 1 and 3, 24 stitches on ndl 2 and 4. The stitch pattern consist of 3 different patterns - a calf pattern, a leg pattern, and an ankle pattern, each divided by a decrease round. What happened was that I knitted the lace cuff, and then started the leg pattern. To me, the lay-out of the pattern in the magazine was a bit confusing. I started with the charted cuff pattern on p 117, and then went back to the stitch guide on p116. My mind must have decided that I could skip the upper part of that stitch guide, because I had already done 'the first part'. Bad assumption ! I was really struck on the pattern, and could not figure out what went wrong. Luckily, there is a yahoogroup (the knitlist), where I could ask the question. Lori Gayle, a designer that regularly published in IK, helped me out. Thanks again Lori, the socks are on their way now. Yarn used : 'Annel extra' again, this time in a slightly heathered silver grey. Wow - great work on the socks. They both look fantastic. I really want to try that spiral boot sock. Thanks for the notes! Ooh, wat zijn ze mooi geworden! Heerlijk garen he, CTH supersock? De voetzolen vilten een heel klein beetje in het gebruik, maar daardoor slijt het materiaal nauwelijks. I looked around at your blog and really like the Lizard Ridge you are knitting. I's going to look great when it's finished. Are you going to knit the Mystery Stole 3 too ? Haven't made 1 and 2 yet but do have the patterns for it.